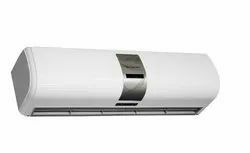 We are a leading Manufacturer of stainless steel washroom recesses panel, recesses panel 3 in 1, hand dryer cabinet, commercial air curtain, virgin plastic air curtain and white air curtain from Surat, India. Smart technologies from Dolphy inspire, presents wash room panel systems, that gives a fast and easy, professional look with a dash of utility & performance. 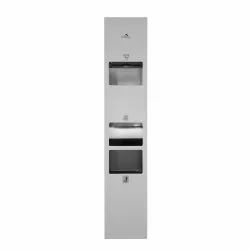 Full-height panels that offer right from energy efficient built-in hand-dryers, paper dispensers to waste receptacles. Built sturdy, designed to maintain hygiene, makes it the preferred choice. used in the public washrooms in Airport, Hotels, Restaurants, industries, pharma company, Olympic Stadiums, Hospitals, Supermarkets, Shopping Mall, Office buildings, Schools and home. Long Lasting Life: best quality 304 grade stainless steel (anti fingerprint material ) Vandal Proof Body : Perfect selection of material & design to protect from vandalism. Hygienic Environment : Keeps your hands and washroom germ free. Essential for Green Buildings : Lesser carbon footprint as compared to regular products. Usage/Application hotel, restaurant, mall, hospital, industries, kitchen, etc.. Door size 3 feet, 4 feet. This is our "Dolphy" heavy duty ABS extreme accelerating Commercial Hand White Dryer. This hand dryer truly says its name by its extreme power. Amazing power at such a reduced price. This product is highly used in public places such as schools, colleges, bars, clubs, restaurants, warehouses, pubs, shopping centers, theaters etc. A quick hand dry within 6 seconds. Purchase with confidence. Usage/Application public toilet, hotel, hospital, airport, bathroom, etc. 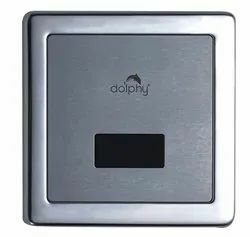 Dolphy offers Automatic concealed type urinal flushers for washrooms. Usually in urinals water is not at all flushed or it is continuously flushed causing lot of wastage of water & unhygienic Conditions. New automatic flush operates in two-stage first pre flush for two seconds when the person approaches the urinal & post flushes when urinal is used. Automatic operation saves lots of water & making the it hygienic and non-contact. The unit is very compact & consists of sensor, valve & battery pack mounted inside flusher. Sensor is based on micro-controller, which has self adjust detection zone & has sleep mode when flusher are not used for long time. With state of art design flushes water automatically once in 24 hours if the toilet is not used. This prevents foul smells. The automatic operation thus avoids the possible misuse & wastage of water. FEATURE : SELF-FLUSH : it will flush automatically through infrared detection units WATER - SAVING : it will flush one or two sections intelligently as per its different occupied time. it will flush 1.5-3L Water Flux When occupied Within 1os And it will Flush 2-4L Water Flux When Occupied over 10S note water pressure should between 0.3Mpa and 0.6mpa. SANITATION : When one leaves detection zone,the machine will flush automatically.Efficient cleaning makes us convenient and hygienic,which prevent us from mutual bacteria infections. INTELLIGENCE : it is controlled by micro-computer and self -adjust detection Zone.No need to manual adjustment. LOW POWER CONSUMPTION : its 4AA alkaline batteries can be used for two and a half year at 200 cycles a day (NOTE : battery should be produced by brand manufacturer and shouldn't be stocked half year from its production date) AGAINST FOUL CHARACTER : it will flush automatically every 24 hours if it haven't been occupies,which can avoid foul oder around room when the trap is dry. Smart technologies from Dolphy inspire, presents wash room panel systems, that gives a fast and easy, professional look with a dash of utility & performance. 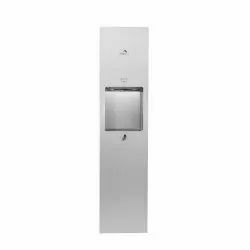 Full-height panels that offer right from energy efficient built-in hand-dryers, paper dispensers to waste receptacles. Built sturdy, designed to maintain hygiene, makes it the preferred choice. used in the public washrooms in Airport, Hotels, Restaurants, industries, pharma company, Olympic Stadiums, Hospitals, Supermarkets, Shopping Mall, Office buildings, Schools and home. Long Lasting Life: best quality 304 grade stainless steel (anti fingerprint material ) Vandal Proof Body : Perfect selection of material & design to protect from vandalism. Essential for Green Buildings : Lesser carbon footprint as compared to regular products. Smart technologies from Dolphy inspire, presents wash room panel systems, that gives a fast and easy, professional look with a dash of utility & performance. 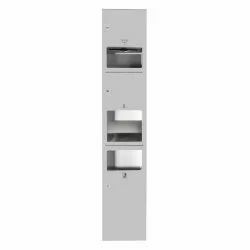 Full-height panels that offer right paper dispensers to waste receptacles. Built sturdy, designed to maintain hygiene, makes it the preferred choice. used in the public washrooms in Airport, Hotels, Restaurants, industries, pharma company, Olympic Stadiums, Hospitals, Supermarkets, Shopping Mall, Office buildings, Schools and home. Long Lasting Life: best quality 304 grade stainless steel (anti fingerprint material ) Vandal Proof Body : Perfect selection of material & design to protect from vandalism. Hygienic Environment : Keeps your hands and washroom germ free. Essential for Green Buildings : Lesser carbon footprint as compared to regular products.